First, the disclaimer: Darren Aronofsky’s movie Noah is not faithful to the Bible story. If your primary interest is to see a dramatization of the Bible narrative of Noah and the Ark as told in Genesis 6–9, this is not the movie for you. Let’s just say that this disclaimer is a masterful piece of PR designed to placate the faithful while still giving the impression that Noah is faithful to the Bible story. For the most part, it’s not. We’ll list some of the accuracies and inaccuracies of the movie shortly. Yes Noah does get some things right. The reference to movies “inspired by a true story” is apt: this movie does draw its central theme of the Great Flood, along with the names of various characters, from the Bible story. However, the departures from the Bible version are so fundamental and overwhelming that the movie must be viewed as a very different story than the one told in the Bible. Why would anyone want to see Noah? It’s a big American action flick that engages with Biblical themes, even if it doesn’t get them quite right. And unlike many previous dramatizations of the story, it does take a serious stab at capturing the intensity of a mythic Biblical event that changed the course of humankind. After seeing this film, it is no longer possible to imagine Noah as some delightful Doctor Doolittle character from a cute little children’s story. For that alone, it is worth seeing the film. For now, let’s take a closer look at the movie Noah, and how it compares to the Bible story. As it turns out, the movie delivers a modern story about our relationship with the earth, while the book delivers an ancient story about our relationship with God and with one another. Let’s start by giving credit where credit is due. Though the movie departs heavily and fundamentally from the Bible story, the producers did do their Biblical homework. In some of the details of the movie, they have brought out aspects of the story of Noah, the ark, and the flood that are commonly overlooked. Of course, this is a movie about a great flood that destroyed all non-marine life on earth except what was preserved in the ark. In that general outline, it does follow the Bible story. Noah, his wife, and his three sons Shem, Ham, and Japheth are here in the flesh. Tubal-cain, a descendant of Adam and Eve’s first son Cain, is a metal-worker as described in Genesis 4:22. The vast bulk of humanity on earth is wicked and violent, leading to God’s decision to destroy all land-dwelling creatures on earth except those preserved in the ark (see Genesis 6:5–13). The ark’s scale and dimensions are faithful to the brief blueprint provided in Genesis 6:14–16. This is not the tubby, kid-friendly ark pictured in children’s Bible storybooks. Its true dimensions are more like those of a modern ocean-going oil tanker or cargo vessel. Yet Aronofsky’s ark has a certain primitive roughness about it that is evocative of what such an ark might have looked like. The flood of water comes not only from the rain falling from above, but from the “fountains of the deep” gushing up from below the ground, as stated in the Bible (see Genesis 7:11; 8:2). After a long voyage, the ark comes to rest in a mountainous region (Genesis 8:1–5). Then more time elapses before the inhabitants can leave the ark and begin their new life on dry land after the water recedes (Genesis 8:6–19). The iconic dove with an olive leaf in its beak (Genesis 8:10–11) makes its appearance along the way. One of the reasons I enjoy watching “unapproved” Bible-based movies is that they often bring out little-known and little-noticed details of the Bible story. In stepping out of the usual line of Noah films, Aronofsky also stepped outside of the traditional dogma related to the story. This made it possible to highlight elements of the narrative that tend to be washed out by traditional, accepted perspectives on the Bible. 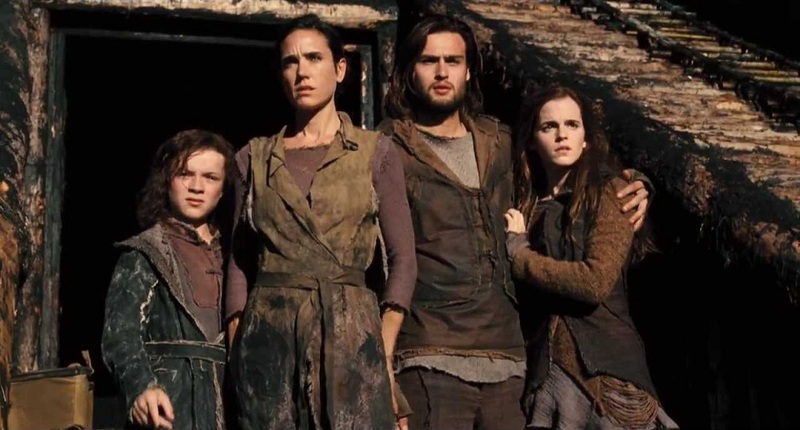 For example, one criticism I’ve read a number of times in the online discussions is that the movie pictures Noah and his family as vegetarians—supposedly for modern, politically correct reasons. However, if Noah was indeed “a righteous man, blameless in his generation,” who “walked with God” (Genesis 6:9), then unlike the evil mass of humanity in the world around him, Noah and his family would have obeyed God’s rules about what to eat. And as pointed out in the second bullet point above, God’s commandment was that humans of Noah’s generation were to eat fruits, vegetables, and grains. After the Flood, Noah and his family were free to eat meat by God’s command in Genesis 9:1–4. But up until that time, “walking with God” meant being vegetarian. In short, the vegetarianism of Noah and his family is not some modern PC innovation. It is based solidly on the Bible. It’s just that this Biblical fact is not commonly brought out in traditional depictions of Noah. This is just one example of how movies that go outside the box of traditional religious thinking often cover aspects of the Bible story that are commonly missed or ignored. For that reason alone, it is worthwhile for broad-minded Christians to watch this movie. It is also good to read Genesis chapters 6–9 and recognize where the movie departs from the Bible story. And Aronofsky’s Noah does depart from the Bible story in a big way. Let’s look at some of the biggest departures. Standard Hollywood action movie tropes require a hero, a villain, an epic battle between their followers, and a final mano a mano showdown in which the hero vanquishes the villain after taking his own lumps in the clash. Darren Aronofsky’s Noah serves it up. Noah (played by Russell Crowe) is the hero, and . . .
Who’s he? I don’t remember him in the story of Noah and the ark . . .
That’s because he isn’t in it. But Aronofsky needed a villain to make the movie work as an American action flick. So he grabbed a likely candidate from earlier in the Bible story, and plugged him into his screenplay for Noah. Why did Aronofsky pick Tubal-cain? Probably because Tubal-cain (played by Ray Winstone in the movie) was part of the last generation of Cain’s descendants mentioned in the Bible, and because he is described as a metalsmith, so that he could have made weapons. The Bible story is silent on whether he was still alive at the time of the Flood. He certainly didn’t stow away on the ark as depicted in the movie. The animated stone creatures called “the watchers” have been roundly criticized as the silliest part of the movie Noah. Supposedly these creatures are fallen angels, punished by God for their apostasy by being thrown to earth and having their angelic bodies encrusted in stone. They go on to defend the earth, get slaughtered and almost wiped out by evil humans, and achieve their ultimate redemption by helping Noah to build the ark and then mounting a final defense against the attacking masses of degenerate humans desperately attempting to battle their way to the ark before the flood engulfs them. None of this happened in the Bible story. The very idea of fallen angels has scant support in the Bible. It comes mostly from later interpretations and embellishments on a few cryptic Bible verses, plus brief mentions in an ancient book or two that never made it into the Biblical canon. Regardless of these sources or our interpretations of them, these beings simply don’t figure into the main action of the Biblical Noah story. The closest the Bible story comes is that as the Noah narrative begins in Genesis 6:1–4, “the sons of God” see that “the daughters of humans” are beautiful, and have children with them. These children become the “Nephilim,” described as “heroes that were of old, men of renown,” and traditionally pictured as giants. This is a strange, much-debated passage in the Bible—and we can’t do it justice here. However, the result would be larger-than-life human heroes, not supernatural fantasy-themed stone creatures as depicted in the movie. Setting aside the silliness of the stone creatures, there is a bigger problem with their role in the movie. In the Bible story, the existence of these Nephilim, or giants, is offered as a demonstration of how evil and corrupt humanity has become, and of the need to wipe that corrupted humanity off the face of the earth. In the movie, even though the stone giants are supposed to be fallen angels, and thus evil, they are transformed into the good guys—the final defenders of the earth until Noah himself carries the torch forward to a watery victory. In other words, the stone giants in the movie serve the opposite role that the Nephilim do in the Bible story. They have been transformed from the villain’s army into the hero’s army. Then why are they in the movie? Because a big Hollywood action movie requires a big, climactic battle scene. The massive stone creatures and their battle against the oncoming hordes of evil humans provide one. Unfortunately, it is a rather trite, derivative battle scene—and not very interesting to watch. But if you want to attract that key young male audience, you’ve got to have a big battle. So even though there is no such battle in the Bible, Aronofsky provides one for his audience. It’s all part of making a blockbuster action flick that sells tickets and packs theaters. Still, if it helps attract new audiences to watch a movie with Biblical themes, that’s not all bad. This is an injection of modern themes into an ancient story. It’s true that God originally placed humankind in the Garden of Eden “to tend it and keep it” (Genesis 2:15). This does indicate that God intended people to live in harmony with nature. However this ecological theme doesn’t figure into the Biblical story of the Flood in any significant way. It’s not that this is a bad or wrong theme. It’s just that it’s a modern theme. Today, humans have developed technology and a population capable of seriously disrupting the earth’s ecosystem. Today, there is a general concern that we are doing just that. But in the earlier era of humanity in which the story of Noah was composed, there was no such widespread ecological concern that would cause a civilization-shaping origin myth to highlight that particular issue. In the Bible, the reasons given for the destruction of all land-based life on earth is that “the wickedness of humankind was great on the earth, and every inclination of the thoughts of their hearts was only evil continually” (Genesis 6:5), and that “the earth was corrupt in God’s sight, and the earth was filled with violence. And God saw that the earth was corrupt; for all flesh had corrupted its ways upon the earth” (Genesis 6:11–12). The movie does depict that human violence and corruption in several scenes of barbarity in the camps of the evil hordes of humans. But the ecological disaster depicted in the movie, while not necessarily contrary to the Biblical reasons for the flood, simply isn’t mentioned in the Bible. The general implication of the Bible story is that humans were evil, corrupt, and violent toward one another, and were violating the commandments of God wholesale—and that is why God decided to wipe them out. In short, Aronofsky is addressing contemporary environmental concerns in a movie set in times when those particular issues were barely on the horizon of human awareness. The earlier departures from the Bible story could be excused for the purpose of making a popular, contemporary American film adaptation of the story of the Great Flood. But now we are getting to changes that aren’t just about cinematography. This is where the movie begins to seriously depart from the “essence, values, and integrity” of the Bible story. In the movie, Noah has a wife—and unlike in the Bible story, his wife has a name: Naamah (played by Jennifer Connelly). The identification of Noah’s wife with Tubal-cain’s sister Naamah is based on Jewish midrashic commentary. During the course of the movie, Noah’s eldest son Shem also gains a wife. She, too, gets a name in the movie that she doesn’t have in the Bible: Ila (played by Emma Watson). She first appears as a young girl rescued by Noah and his family from the murderous hordes of evil humans. Ham, Noah’s second-born child, tries to get himself a wife at the last minute. But she is caught in a spring trap and trampled to death by those same murderous hordes as they rush toward their final battle scene at the ark. Japheth is too young even to think about having a wife when the family boards the ark. While this may drive some great human drama in the movie, it is a completely different drama than takes place in the Bible story. In the Bible, all three of Noah’s sons are grown men with wives of their own when they enter the ark (see Genesis 6:18; 7:13). Why would Aronofsky change the story so that only one of Noah’s sons has a wife, and she had sustained an injury that would prevent her from bearing children? This is where the modern eco-perspective injected into the movie completely overturns the significance of the Bible story. 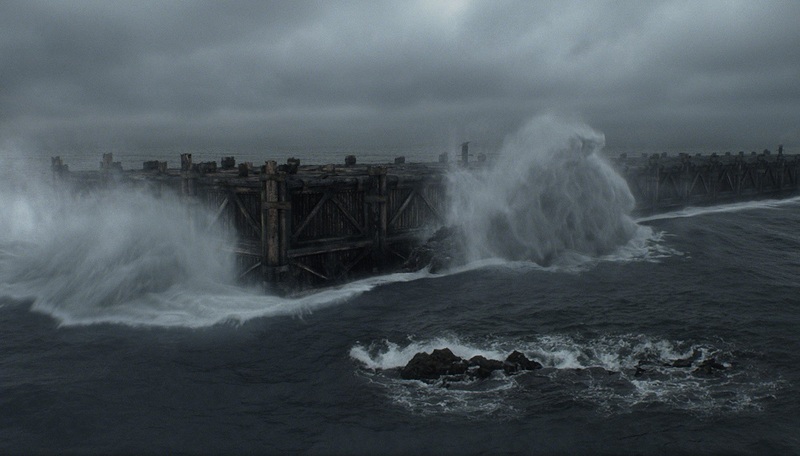 In the movie, Noah believes that God intends to wipe out all human beings, including Noah and his family. He believes that his purpose in life is to ferry breeding pairs of every species of animal to safety so that the animals can repopulate the earth after the flood, and live in pristine innocence without the disturbing and destabilizing presence of humans. In pursuance of this purpose, Noah doggedly sets his mind to making sure that there are no more human offspring to sully the earth after the last of his own sons dies. 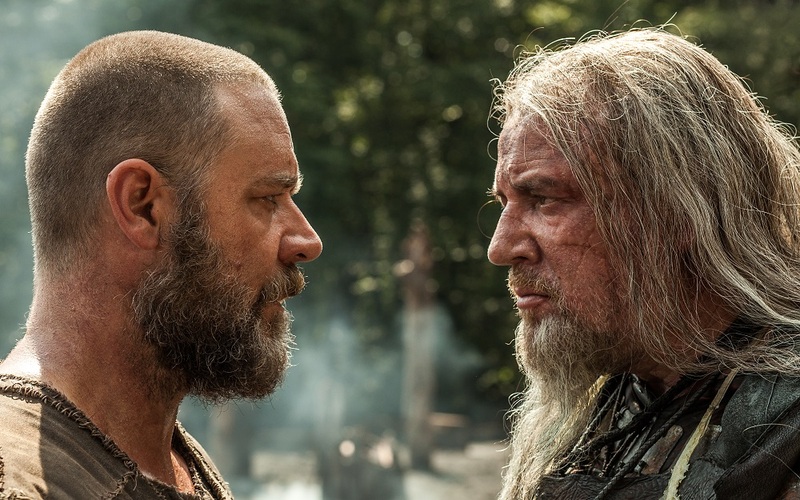 This sets up the movie for its greatest tension and its most shocking climax: Noah’s intent, almost carried out, to kill his two newborn granddaughters. You see, at the behest of Noah’s wife, his grandfather Methuselah (played by Anthony Hopkins) mucks up Noah’s plan by miraculously restoring his daughter-in-law’s ability to bear children. The most heart-wrenching scene of the movie has Noah, dagger in hand, about to dispatch his twin granddaughters as his weeping daughter-in-law holds them in her arms on the roof of the ark. It’s not that such a thing would be unthinkable in the Bible. A very similar event occurs later in Genesis. In the searing story traditionally called “The Sacrifice of Isaac” (see Genesis 22:1–19), Abraham nearly slays his son and heir Isaac before his hand is stayed by an angel. This is likely where Aronofsky got the idea for Noah’s intended infanticide. But this is a story about Noah, not about Abraham. In the movie, Noah is unsure what God wants of him, and why. In the Bible story, God clearly spells it all out for Noah in several long speeches. He assures Noah before the flood that while all the rest of humanity will die, God will establish a covenant with him (Genesis 6:17–18). This promise is fulfilled after the flood. God’s covenant with Noah and his descendants includes a promise that there will never again be a flood to destroy all the earth (Genesis 9:8–17). The sign of this covenant is the rainbow that would appear in the clouds after the rain—an image that the movie invokes, unexplained, in its final sequence. All of this points to a fundamental difference in the theme of the movie compared to the theme of the Bible story. In the movie, though the theme of good vs. evil is certainly present, it is trumped by the theme of humans against nature. Humans are pictured as destroying the earth’s ecosystem through their greed and lust for power. Therefore the human race must be snuffed out so that earth’s flora and fauna can once again flourish innocent and undisturbed in their pristine state. In other words, in the movie, humanity itself is seen as the primary evil. It is only by the slimmest of margins that love and compassion win out over the annihilation of humanity through an act of infanticide. It’s almost as though Aronofsky wished he could wipe out humanity completely, but the human storyline just wouldn’t allow it. Whatever happened in those prehistoric days, we know that humanity survived it. In the movie, Noah is plunged into despair and drunkenness, believing that he has failed in his mission because humanity will survive the flood and repopulate the earth after all. The drunkenness is based on the Bible story—but not the despair and the sense of failure on Noah’s part. In the Bible story, there is never any question that humanity is meant to survive and repopulate the earth. When God instructs Noah to build an ark, he first says that Noah, his sons, his wife, and his sons’ wives are to enter the ark. Then he says that pairs of each of the animals are also to enter the ark. In the Bible story, the tension is not between humans and nature. It is between the vast bulk of corrupted humanity and the small remnant of good and faithful people represented by Noah and his family. The purpose of the flood is to cleanse the evil from the earth so that the good remnant can continue and repopulate the earth. The earth has gotten off course. The flood is a major mid-course correction to get it back on track. Of course, there is more to it than that. But that’s a subject for the next post. If you wish, go ahead and watch the movie. It is entertaining and powerful in its own way. And it does humanize the Bible characters in a way that is missing in many previous renditions of the Noah story. If nothing else, it conveys something of the intensity of a story in which one man and his family stand against the masses of humanity as the sole surviving remnants of goodness and light in a dark and corrupt world. I do give Aronofsky kudos for conveying that intensity, even if the intensity of the conflict he depicts is based on a modern premise rather than on the ancient Biblical one. And it is good that the movie has brought into the spotlight in contemporary adult society a powerful Bible story that is often relegated to the realm of charming fairy tales for the nursery. Noah and the Great Flood is not merely a children’s story. It must be taken seriously as a mythic tale of the origins and early development of humankind. ‹ The Bible Says It, and I Believe It! I appreciate the review provided by Mr. Woofenden. Rather than summarily dismissing the movie as anti-Bible and anti-Christian, he speaks to the pros and cons. 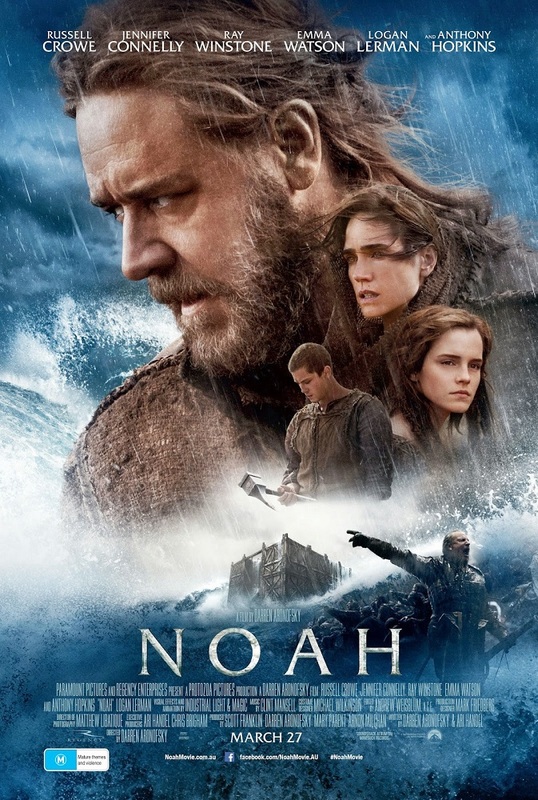 Is the movie faithful to the actual story of Noah? Of course not. No surprise there. Did it entertain? Yes, though the stone giants were, in fact, ridiculous. Did it inspire me to research how it differed from the actual story of Noah? Yes it did, and it is that point that I believe renders the movie a worthwhile watch. Do I know more now about the story of Noah than before I watched the movie? Of course, but not from watching the movie, rather by then wanting to learn the real story through some research. And Mr. Woofenden was the superb guide for me to do so. Thank you. You’re welcome! And thanks for your kind words. I’m glad this review provided what you were looking for. You’ve neatly summed up the essence of what I wanted to communicate about the movie. Overall, a great review. Thank you for sharing with us. Thanks, fredsbend. Good to see you here. I found your review to be illuminating and incisive, certainly better than several others that also pointed out the discrepancy with the Bible and some that extolled some of the creative aspects. Your review was much more nuanced and textured. Despite only having a passing familiarity with the Bible I was almost immediately struck by inconsistencies that had me getting up from the couch and TV to check things on the internet. It was clear from the first that there were inconsitencies between the Biblical story and the movie and I was almost prepared to turn off the TV but, as you point out, the fleshing out of some of the lesser known paspects of the Biblical account represented in the move kept my attention. I was impressed that you made the connection between the movie and the Biblical (and Koranic) story of Abraham and the sacrifice. Kudos on a well thought out and insightful review. Thanks. I would like to add that your use of the term “intensity” is apt. Despite the differences from the Biblical account, if we keep in mind the original intent of the account, the movie shows us the hardship, anguish, and dilemmas faced by Noah and his family. Thanks for stopping by, and for your thoughtful comments. I’m glad you enjoyed the review!